Looking for a New Career? 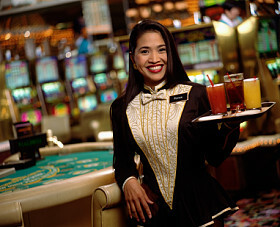 A Job in the Hospitality Industry May Be Right for You – TAM Card® Nation in Vegas! Ever you wish you had a job you love? If you’re looking to make a career change, you may want to consider looking for your dream job in the hospitality industry. Hospitality professionals work in a variety of positions including bartenders, servers, managers, hosts, security professionals, clerks and more. A career change could result in a number of benefits including increased job satisfaction, increased earnings, a chance to try something new and expand your skill set, and more. You enjoy interacting with customers. A desk job isn’t for everyone, and if you like being around other people, a career in the service industry may be right for you. Many hospitality professionals love that their careers allow them day to day interaction providing quality customer service to their guests. If you enjoy a job where you are face to face with your patrons, you may enjoy a career in the hospitality industry where you’ll get to converse with your customers, meet new people and listen to others. You have a great personality. One can make a lasting impression on patrons and increase their earning potential by having a positive attitude, being helpful and providing excellent customer service. As a server or bartender, you’re often the first, and last, staff member a customer encounters. Your interactions will set the tone for the evening so you want to greet your customers warmly, and leave them reflecting on a positive experience once they head for the door. You love living in Las Vegas and want to share that with others. Nevada in general and Las Vegas in particular is a very popular destination spot, and you’re likely to interact with tourists on a regular basis. By promoting and practicing safe alcohol service, and sharing your insider knowledge about what is great within the city, you can help do your part to ensure that newcomers to Vegas can have a blast, but make it around town and back home without harming themselves or others. Hopefully, they’ll return home to tell their friends what a great time they had! By sharing what the great state of Nevada has to offer, you can not only impress your guests and help them to enjoy a memorable experience, but hopefully they’ll spread the word, and that benefits everyone in the long run. Are you ready to explore the idea of a career in the hospitality industry? A TAM® Card is required for anyone selling or serving alcoholic beverages in Southern Nevada, so be prepared! Many restaurants and bars will ask to see your TAM® Card before you start, so give yourself a head start and a leg up on other applicants by completing your alcohol awareness training and obtaining your TAM® Card today.